The answer to this greeting was “All the children are well.” Even warriors with no children of their own would participate in these exchanges. This custom bore witness to the high value the Masai placed on the well-being of the children among them. “All the children are well” meant that safety and peace prevailed, that the Masai had not forgotten their responsibility for the youngest members of their society. To this day, “Kasserian ingera?” remains the tribe’s traditional greeting. What if, in our great country, we would take to greeting each other in this way: “And how are the children?” Perhaps if we heard this question and spoke it a dozen times a day, we would develop a new attitude as a nation toward how we treat the youngest people among us. Take this a step further. What if the president of the United States, at every news conference, were asked, “And how are the children?” What if that happened with governors, members of Congress and elected representatives at all levels? As a nation, our current treatment of children leaves much to be desired. This is a nation where many children go hungry, receive a woefully inadequate education, lack health insurance, end up in prison, live in environmental sacrifice zones or die from gunshot wounds. We cannot be a truly great nation until the day comes when anyone can hear that question, “And how are the children?” and respond with the words “All the children are well,” knowing deep down that this is the truth. The Frances Perkins Center in Newcastle keeps alive the memory of a time when, despite mistakes and shortcomings, our federal government successfully reoriented itself to serve the welfare of every American during a time of national economic catastrophe and beyond. This massive reorientation is known as the New Deal of President Franklin D. Roosevelt. Frances Perkins was secretary of labor throughout the 12 years of Roosevelt’s presidency and is recognized as “the woman behind the New Deal.” Appalled by how children were abused through factory employment, she contributed to the 1938 Fair Labor Standards Act, which prohibited the employment of children under 16 and required safe working conditions for employed youth. The Perkins Center focuses on a remarkable period in American history, but it is actively concerned with the present and the future as well. Why? Because the New Deal story contains abiding American principles that have been eclipsed in recent decades. These principles once helped to transform a failing social order into a more gracious and generous society. They can do so again. 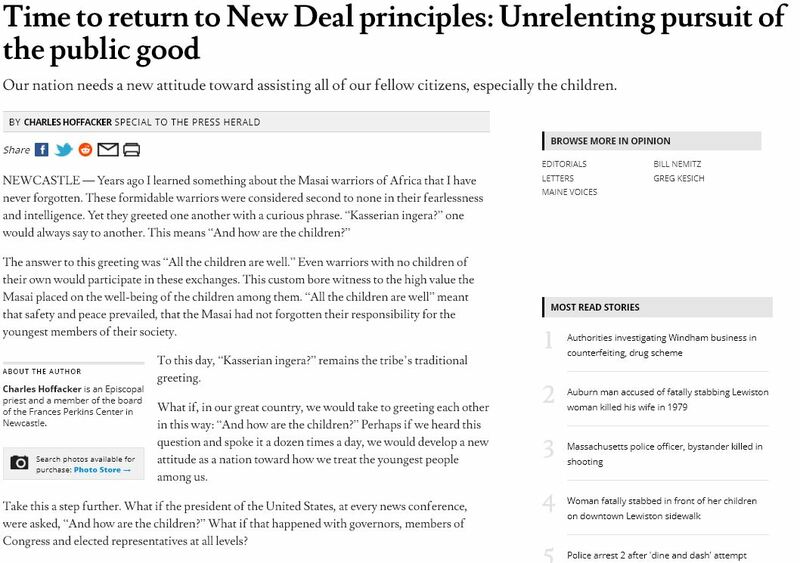 New Deal principles can reconnect our nation to the moral norm that Masai warriors upheld when they asked each other “And how are the children?” and responded “All the children are well.” All the children. No exceptions. The Masai lacked many resources of our so-called “advanced” society, yet their morality insisted that they care for their children. Can we, who claim membership in an “advanced” society, go further and insist on the best possible life for people of all ages? Some countries directly embrace this goal and have achieved significant success in realizing it. The U.S. can do the same. We have the necessary resources. 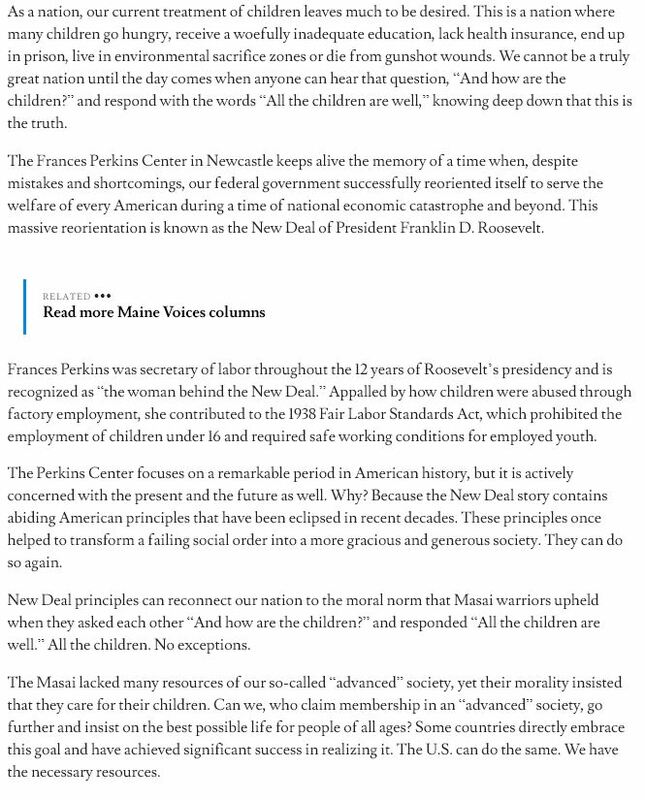 The Frances Perkins Center is not alone in promoting America’s New Deal heritage and not alone in advocating for a more just social order. People and organizations across the land are engaged in this patriotic endeavor. Yet the Perkins Center has something distinctive to offer in the pursuit of the public good, because of the powerful witness of its namesake. The 2020s may turn out to resemble the 1930s. The 1930s saw a hard-won transition from the Great Depression to a new and better deal for Americans. The 2020s can be the time when America leaves behind its current season of troubles and we become a people able to respond “All the children are well,” knowing in our hearts that this is the truth.